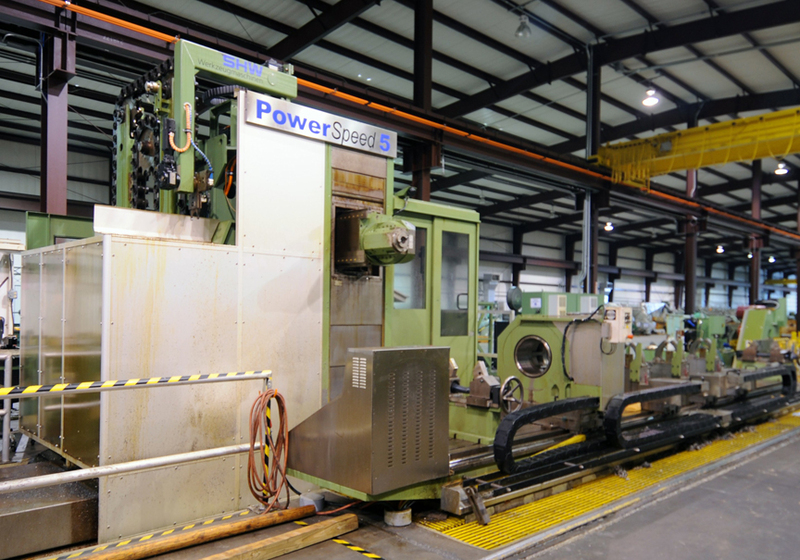 Home > Past Auctions > Complete Boring, Honing & Turning Facility, Support, Tooling & More! WOHLENBERG MDL. PB2-1000 X 10M, new 1991,37” swing over bed, 393” (10 M) max. boring depth, 7.87” solid boring cap, 22,000 lb. max. workpiece weight, 13.93” counterboring cap., 1.19-196 IPM boring speeds, 2.9-1120 RPM main spdl. speeds, 4.09” spdl. bore, 24 ½” 3-jaw universal chuck, 100 HP main spdl. drive, 100 HP boring spdl. drive, double rack drive carriage, Fanuc Powermate PLC, (3) damper rests w/med. dampers, med. size pressure head, chip conveyor, (3) H.D. steady rests, Koolant Koolers Mdl. AFD25000P-ST coolant chiller system, fabricated coolant tank, (2) 50 HP coolant pumps, Polo Mdl. SAFI-T1.7 pressure filter unit w/paper filter, S/N 4466. (2) WOHLENBERG MDL. PB2-1000 X 4M, new 2006, 39.37” swing over bed, 157” (4 M) max. boring depth, 7.87” solid boring cap, 17,6000 lb. max. workpiece weight, 13.93” counterboring cap., 1.19-196 IPM boring speeds, 2.9-1120 RPM main spdl. speeds, 4.09” spdl. bore, 24 ½” 3-jaw universal chuck, 100 HP main spdl. drive, 100 HP boring spdl. drive, double rack drive carriage, Fanuc 21iTB CNC, (2) damper rests w/med. dampers, med. size pressure head, chip conveyor, (2) H.D. steady rests, Koolant Koolers Mdl. AFD25000P-ST coolant chiller system, fabricated coolant tank, (2) 50 HP coolant pumps, Polo Mdl. SAFI-T1.7 pressure filter unit w/paper filter, S/N D4583, S/N D4582. HUGE SELECTION OF BORING HEADS AND TOOLING INCLUDING BTA CUTTER HEADS, COUNTERBORING HEADS, BOTTOMING HEADS, PULL BORING HEADS, REAMING TOOLS, & TREPANNING TOOLS IN VARIOUS SIZES UP TO 14” DIA. WIDE RANGE OF ROLLER BURNISHING HEADS, approx. 30 ranging from 2” to 5 ½” cap. In size sorted in rack. GENERAL (SUNNEN) MDL. GH210-25-41R, new 1998, AB panel view PLC control, 41’ stroke, 18” swing, 1” to 12” bore capacity, 10-90 FPM stroking speeds, 10-230 RPM speeds, 25 HP, hyd. hone expansion, hyd. 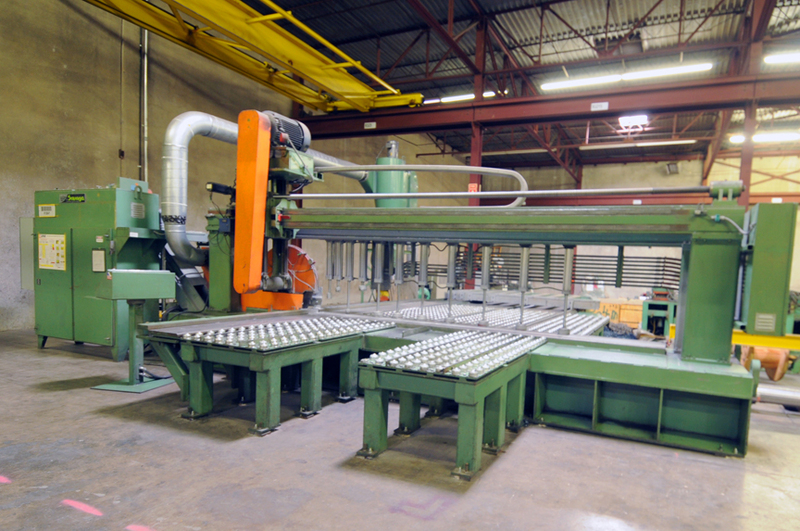 chain drive, (3) whip rests, (2) bushing style steady rests, 32” w x 42’ l double rail fixture table, Flowcon Mdl. HP-150/PBLS-28M paper filter honing oil system, S/N 0898212. SAVAGE 1000 TON MDL. TFS TRAVELING COLUMN, new 1998, 46’ bed length, 34” bed width, approx. 48” distance between columns, power motion v blocks, power motion lift blocks w/hydraulic lift and power rotation, approx. 40” ram face to bed, approx.14” stroke, power gantry travel, digital tonnage meter, .001” digital ram position readout, top mounted hydraulics, S/N 2120. SAVAGE 350 TON TRAVELING COLUMN, new 1980, 35’ bed length, ?? bed width, 25” distance between uprights, 34 ¾” distance bed to ram face, (2) 2” thick x 15 ½” tall v rests, (3) 4” thick x 15 ½” tall v rests, (2) hyd. adjustable ball roller traveling rests, traveling operator platform, top mounted hydraulics, S/N 1429. 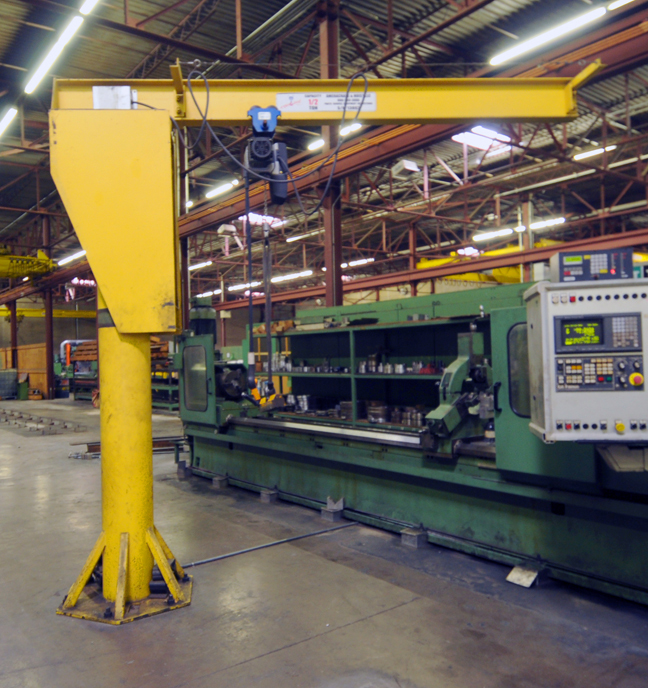 SAVAGE 42 TON, fixed frame machine, 12” between uprights, approx. 10” max. 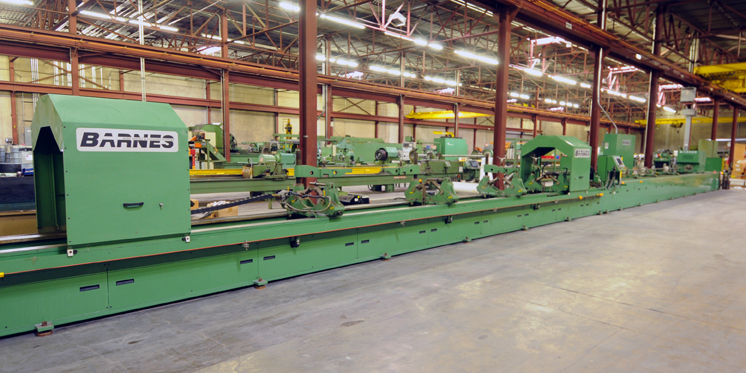 distance bed to spindle face, (2) pop-up pneumatic roller rests, 20’ infeed and outfeed heavy duty roller conveyor, 6” wide, independent hydraulic system, S/N 1532. WOHLENBERG MDL. 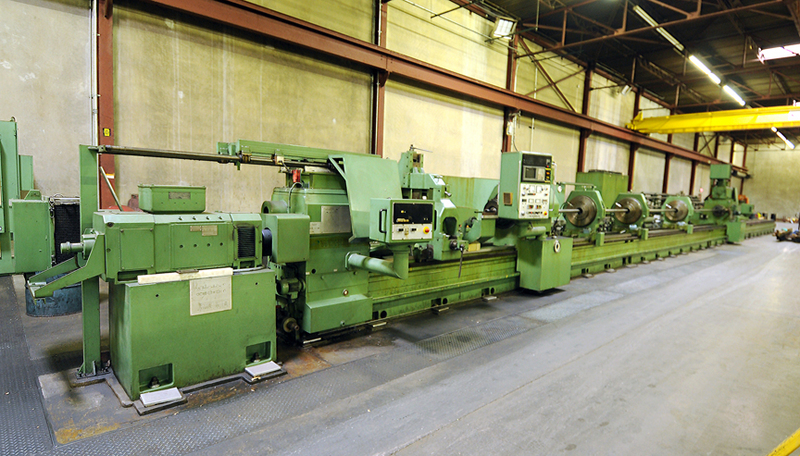 V1180 ENGINE LATHE, new 1983, 40.35” swing over bed, 26.37” swing over cross slide, 36’ distance between centers, 14 76” spindle bore, spds: 1.8 – 355 RPM, front and rear 31 ½” dia. 4-jaw chucks, (3) lg. steady rests, (3) med. steady rests, power compound, grinding attachment, inch/metric threading, 4-way tool post, taper attachment, (2) outboard roller steady rests on pedestals on sliding base, S/N 4300. SPARK MDL. 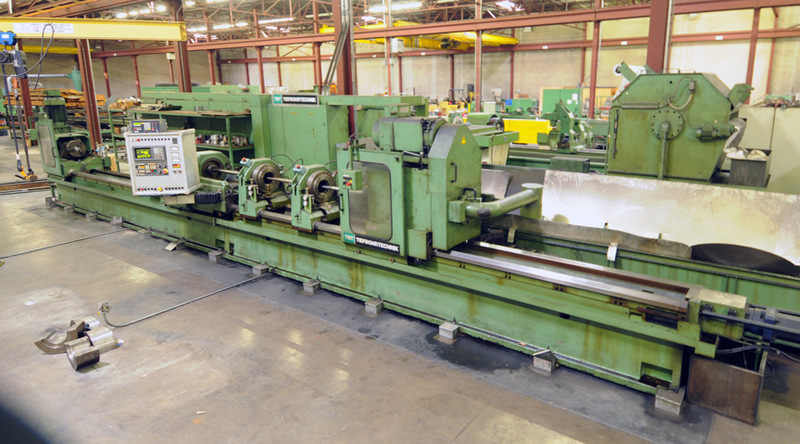 CW6636 HOLLOW SPINDLE ENGINE LATHE, new 2010, 39.37” swing over bed, 25.19” swing over cross slide, 20’ distance between centers, 14.17” spindle bore, speeds: 8 – 315 RPM, 22KW drive motor, 31 1/2” front and rear 4-jaw chucks, power compound, (2) steady rests, pwr. tailstock body, taper attachment, inch/metric threading, control pendant, 4- way tool post, follow rest, outboard steady rest w/adjustable height v roller unit, S/N 12-480. LEHMANN MDL. 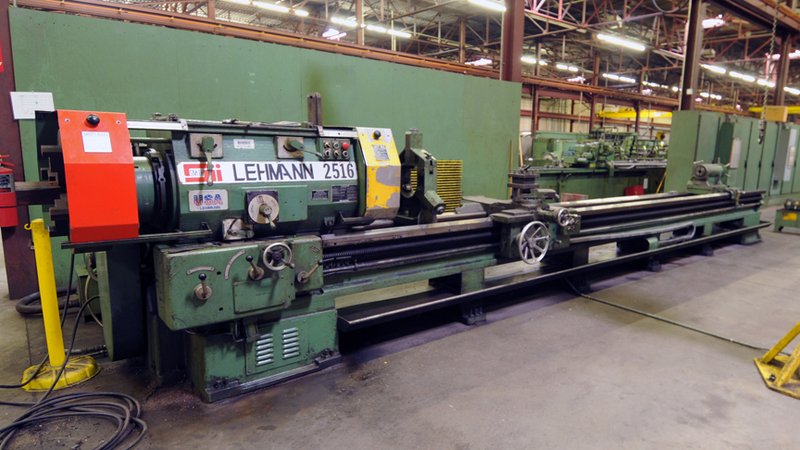 2516 HOLLOW SPINDLE LATHE, 25” swing over bed, 16” swing over crosslide, 240” distance between centers, 12” spindle hole, spds: 10 – 397 RPM, airtrip threading, 4 way tool posts, roller jaw steady rest, front and rear 24” dia. hollow spindle chucks, S/N 241215121, rapid traverse. LODGE & SHIPLEY MDL. PROFITURN 40, rebuilt and retrofitted 2015 w/Fanuc 0iTD CNC control, 34-1/2″ sw. over bed and carriage wings, 20″ sw.over crosslide, spds: 6–650 RPM in (3) ranges, 12-1/2″ spdl. hole, 14′ dist. btwn. centers, 4-pos. sq. turning turret, 12-pos. hex boring turret, 45 kW main spdl. drive motor, front and rear 28″ dia. 4-jaw chucks, outboard work suppt. rest w/pneu. lift, roller jaw steady rest, pwr. 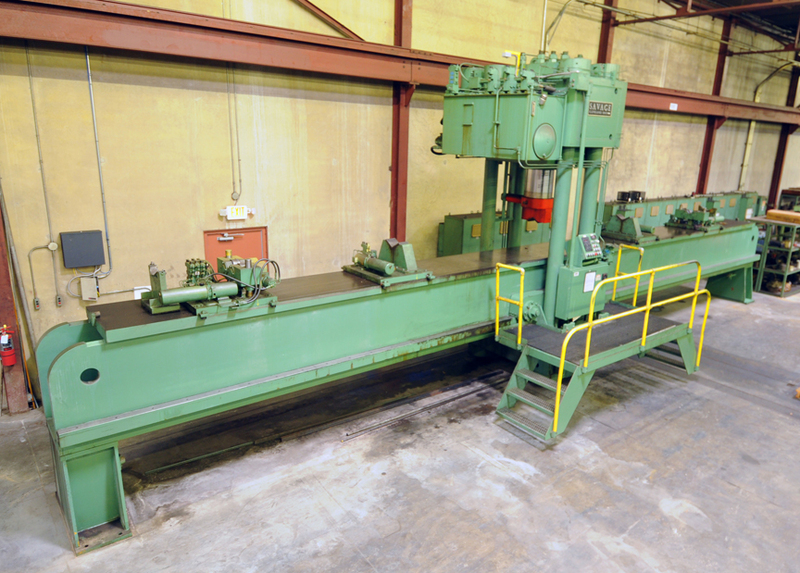 tailstock, additional control axis for customized tooling, full length chip conveyor, S/N 50938 (Auctioneers Note: S/N 50938–is 90+% finished on rebuilt and retrofit. The bid for finishing this machine will be available at time of inspection). LODGE & SHIPLEY MDL. PROFITURN 40, Fanuc 18iT CNC control, 34-1/2″ sw. over bed and carriage wings, 20″ sw. over crosslide, spds: 6–650 RPM in (3) ranges, 12-1/2″ spdl. bore, 14′ dist. btwn. centers, 8-pos. sq. turning turret, 12-pos. hex boring turret, interchangeable 4-pos. turning turret and 6-pos. boring turret, 37 kW main spdl. drive motor, front and rear 32″ dia. 4-jaw hollow spdl. chucks, outboard work suppt. rest w/pneu. lift, chip conveyor, roller jaw steady rest, pwr. tailstock, S/N 50937. (2) SHW MDL. 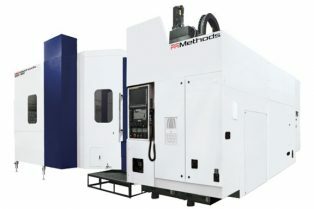 POWERSPEED 5, new 2007, Heidenhain TNC530 4-axis CNC control, 39.37″ x 354.3″ T-slotted work tbl., 314.96″ X-, 63″ Y-, 51″ Z-axis travels, 1,181 IPM rapids, 360 deg. C-axis head swivel, 180 deg. A-axis head swivel, CAT-50 spdl. taper, spdl. spds: 36–6,000 RPM, 45 kW spdl. drive motor, 90-pos. ATC, roll work holding and rotation system incl. ; FIBRO CNC B-axis vert. rotary tbl. w/13.77″ thru hole, 27.5″ center ht., 5,500-lb. max. rotary tbl. cap., 27.5″ 4-jaw chuck, (3) Autoblok hyd. steady rests, 3.93″ to 13.77″ cap., probe system, (1) manual suppt. rest, scale feed back system, roller chip shields, S/N 5236, S/N 5237. CINCINNATI NO. 2 TOOL AND CUTTER, 6” x 35 ½” power feed swivel table, torret dust collector, tilt swivel spindle unit, gun drill sharpening fixture, universal work head, grinding vice, internal grinding attachment, wheel collets, assorted table change gears, tooth rests, (2) sets of centers S/N F5860-E-81-09-08. BROWN & SHARPE 8” X 18” MICROMASTER SURFACE GRINDER, 8” X 18” fine line magnetic chuck, , fine cross and downfeed, external coolant system, S/N 523-8186-9321. BOWERS PRECISION AIR GAUGE SYSTEM, w/approx. 26 air gauging heads from 1.96” to 7.09” w/mandrel reciprocating air compressor and stand. PRECISION GRANITE SURFACE PLATE, new 2008, 36 X 48 X 6”, 2 ledge design, w/heavy fabricated roller stand, grade A, S/N J-8-08. HEM MDL. H105A, 16” w x 14” H capacity, 1.25” blade width, 7.5 HP, auto. feed, (2) 10’ heavy duty infeed roller conveyors, output table, S/N 366292. METLSAW MDL. CC-510 CIRCULAR, 20” throat depth, variable speed, 10” to 72” circle diameter, pneumatic hold down, blade welder and grinder S/N N.A. HEM MDL. 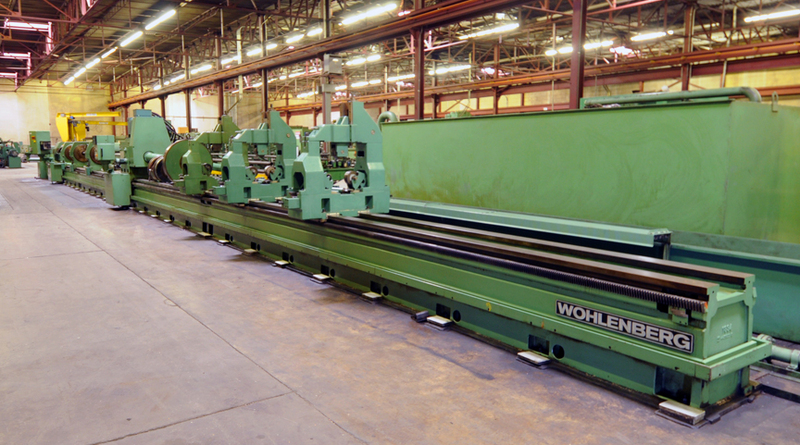 V100LM TILT FRAME, 18” cutting width, 22” cutting height, 1.25” blade width, 5 HP, dual front hydraulic vises, S/N 326390. MSC INDUSTRIAL MDL. 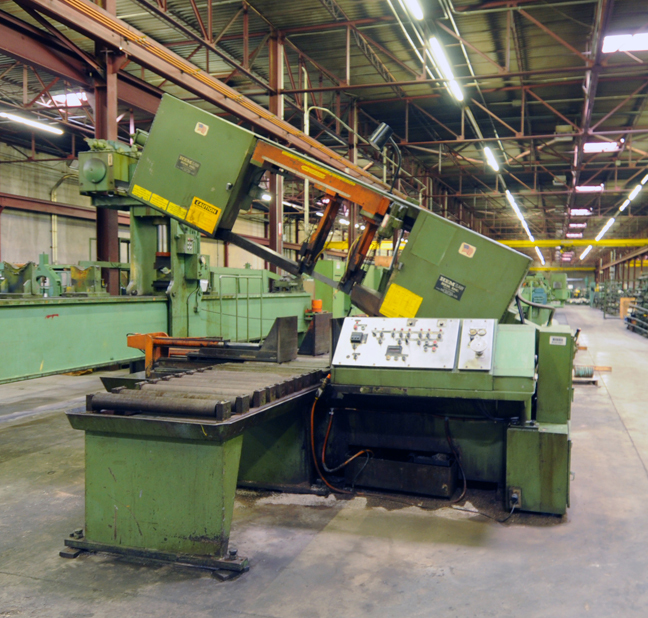 09514654, 24” throat depth, blade welder, grinder, variable speed, tilt table, S/N 0144. SAVAGE TRAVELING HEAD, 144” max cutting width, 144” max. material length, 12” max. material thickness, 40” blade dia., 75 HP blade drive, 16, 000 SFPM blade speed, arranged for non-ferrous material, chip conveyor, cyclone style dust collector, PLC table & head feed system. NEWBERY 30 T. MDL. V4-30ARS VERTICAL INJECTION MOLDING MACHINE, new 1997, Conair SC7.5 carousel dryer, vacuum feeder, S/N 119330-30AS-97. CONAIR MDL. MPA3 PORTABLE CHILLER UNIT self-contained chiller, S/N 42866. SPEEDAIRE MDL. 5F233B, 120 gal. horizontal tank, 10 HP drive, 34.2 scfm @175 psi, 175 max pressure, S/N L9-24-2001-00016. INGERSOLL RAND T30 TANK MOUNTED, 25 HP, mounted to 240 gal. tank, new 1998, S/N 30T887366. ANDCO COMPANY TWO PLANE WIRE STRAIGHTENER, vertical and horizontal straightening rolls, input and output pinch rolls with pneumatic assist, chain drive. CUSTOM PNEUMATIC CUT-OFF PRESS, 9” max. width, under driven up stroking air cylinder. KIRA, MDL. 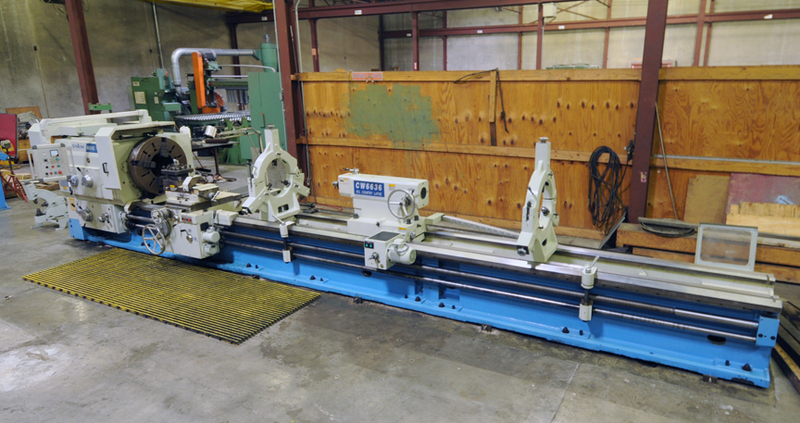 KRTG-540 GEARED HEAD DRILL, #4 Morse Taper Spindle, spds: 95 – 1700 RPM, power feed, adjustable height table, S/N 53908. MEGOMAT MDL. ASM3001A AUTOMATIC TERMINAL CRIMPING MACHINE, w/bowl feed, wire straightener, S/N 0007A0758. ARTOS MDL. PF1 CRADLE FEED, S/N 42465, w/power pay off. 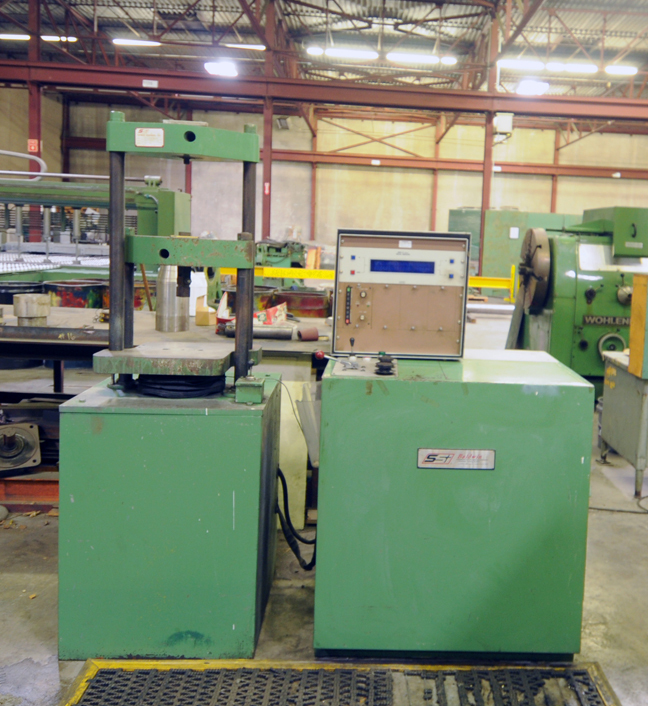 ANVER VACUUM SHEET LIFTER, MDL. EP390M3-110, 3900 LB. LOAD CAP., VP3 vacuum generator, (3) vacuum cups, 12’ lgth, max. 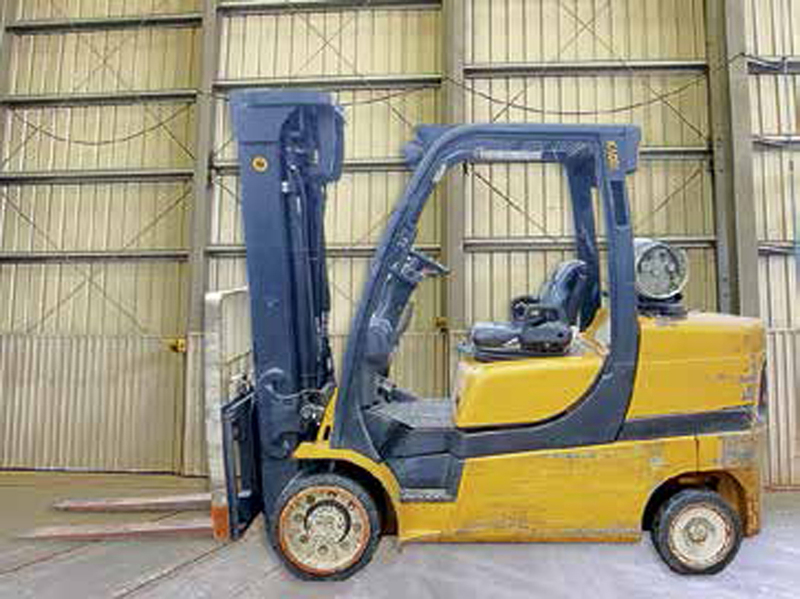 load lgth 12’, max load with 6’, w/built in stand, 110 V operation, S/N EP93141. KADY 7 ½ T. CAP. POWER SHEET LIFTER 15,000 LB. CAP., MDL. HSL7584MSP-1, operation, 96” lgth, S/N 11-46925. SHANNAHAN 4 T. CAP. SPREADER BAR, 24’ ft. l., w/stand, 5 underhung hooks. (4) CUSTOM SPREADER BARS 5 underhung hooks, 400” l, unknown cap., w/stand.